FCC Chairman Ajit Pai speaks with Sen. Jon Tester, D-Mont., as the Senate Committee on Commerce, Science, and Transportation holds an oversight hearing on the Federal Communications Commission, on Capitol Hill in Washington, Thursday, Aug. 16, 2018. FCC Chairman Ajit Pai on Monday applauded his agency’s decision to keep secret months’ worth of data logs sought by reporters trying to shed further light on suspicious activity last year involving millions of fraudulent net neutrality comments. The agency rejected two record requests filed by major publications, the New York Times and BuzzFeed, arguing that turning over the logs would violate the privacy interests of Americans who commented on its net neutrality repeal. The decisions comes after the Federal Communications Commission consistently misled major news outlets about a purported cyberattack against its comment system in the runup to its repeal of net neutrality rules in 2017. Only this summer did Pai finally admit that this so-called attack never occurred, even though he’d claimed the opposite publicly on numerous occasions. The full weigh of this offense ultimately landed squarely (and conveniently) on the shoulders of an ex-official who had departed the agency more than a year before. Over seven months this year, FCC officials defend their false claims that the comment system had been targeted by malicious hackers, even though Pai was himself aware that it wasn’t true. (The 2017 incident, in fact, wasn’t even the first time an FCC official who came to work under Pai pushed a fake cyberattack story in the press.) Meanwhile, the chairman dodged multiple requests for information from Democratic lawmakers in the House and Senate, who, due to being in the minority in both chambers, were unable to compel any type of response. Pai later said he kept the truth quiet at the request of the commission’s inspector general. 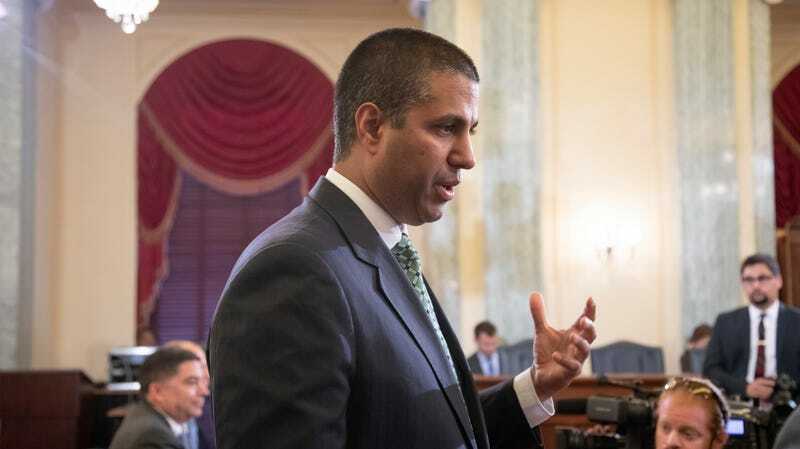 Both requests were denied upon appeal, marking a new chapter in the FCC’s ongoing efforts to keep potentially pertinent details about the 2017 incident—and others—from the public record. When a federal agency formally rejects a FOIA request, or fails to procedurally respond in an appropriate manner, the request may then be submitted for an administrative appeal. Typically, this means more senior officials or top agency attorneys will review the request and how it was initially handled. Once an appeal is denied, the next step for the requester is litigation; asking a judge to review the agency’s withholding of records to ensure its decision comports with the federal FOIA statute. The FCC staff’s decision to withhold the server logs, which would reveal, among other details, the static and dynamic IP addresses of individuals who contributed comments to the FCC, is based in part on the idea that the IP addresses themselves are covered under an exemption to FOIA intended to protect personal privacy. That particular exemption, however, is subject to a balancing test intended to weigh the harm of revealing an individual’s private information against public interest in its disclosure. Notably, the comment system issues at FCC have been widely reported on (see: here, here, here, here, here, here, here, here, and here), and the chairman himself has admitted before Congress that he was misled by his most senior technology official; an allegation that, in FOIA parlance, raises questions about government integrity which may affect public confidence. The FCC also withheld the logs under another exemption that can be applied to records compiled for law enforcement purposes. The reasoning provided by the FCC, which seems fairly dubious, is that the comment system has “a rational nexus to the Commission’s law enforcement functions,” and that releasing the logs might encourage attacks not only only against the comment system itself, but “more sensitive Commission systems that are directly relied on by the Commission in carrying out its law enforcement and national security functions.” In effect, the FCC is arguing that releasing the logs might somehow tip off malicious hackers with a way to infiltrate sensitive FCC systems. Further, the agency’s rejection notice states that the information deemed sensitive is not segregable, meaning it cannot simply redact portions of the logs and safeguard the privacy and law enforcement interests it has asserted exist. Beyond the FCC’s false statements to Congress and the public, however, are other considerations that might compel a judge to order the server logs be turned over. The New York Times may or may not be specifically investigating the fake cyberattack—though the server logs do overlap with that incident—but the claims that half a million comments about net neutrality were submitted with Russian email addresses. Moreover, BuzzFeed’s Singer-Vine argues that the IP addresses he’s requested access to would not actually violate the privacy interest of the Americans whose names are attached to them because the agency itself has acknowledged that the comments are fraudulent. In a statement to Gizmodo last year, Rosenworcel said: “To put it simply, there is evidence in the FCC’s files that fraud has occurred, and the FCC is telling law enforcement and victims of identity theft that it is not going to help,” referring to Pai’s refusal last year to cooperate with state investigators probing the fraudulent comments, some of which bore the names of U.S. officials, including former President Barack Obama. FOIA enthusiasts have come to recognize the FCC as one of the most frequent violators of the statute. Earlier this year, for example, the agency denied Gizmodo’s request for information about a video it produced for a dinner hosted by telecom industry leaders and attended by Pai. Under FOIA, there are no exemptions intended to protect federal agenices or senior officials from public embarrassment. But since taking control of the agency in early 2017, that’s exactly how the FCC has behaved. Hopefully, the judge handling the New York Times case won’t help Pai and his cronies continue to abuse the law.